While Pierre Huyghe’s recent works introduced a relationship to the immensity of the venues in which they were presented, here we make our way into the Serpentine Gallery’s antrum, punctuated by the epileptic effects emanating from the surfaces of massive LED screens, and by the trajectories of a mass of flies let into the place. In it are entangled stealthy attempts at figuration, while, on the floor, at the mercy of our passing steps, are scattered the dusty leftovers of the artist’s repeated sanding operations. If these latter somewhat confirm the horizon of expectation engendered by an œuvre which has thus, on many an occasion, made a dent in the exhibition’s official box-like space, their resilience mingles with the imago which radiates out of this archipelago of screens from which no coherent image seems to emerge. These impressive surface effects find their source in Yukiyasu Kamitani’s recent research, at Kyoto University, where he has developed an artificial intelligence informed by the invariably unquenched ambition to lend a reality to our thoughts. Put in more tangible terms, those taking part in the scientific experiment are subjected to an examination which makes it possible to follow, in real time, their neuronal activity when they see or think about a certain number of images. This system is repeated in order to culminate as faithfully as possible in a correlation between brain waves and the elements of a predetermined picture bank. The experiment was thus renewed through a subject and based on a set of data which the artist gave to the laboratory, corresponding to three types of “intelligences” or active agencies in his work: man, animal and machine. The computational action is then exposed here to the field of interferences that is created in particular in the variations of luminosity and temperature, and in the presence of insects or visitors, until a point of panicked rhythm is reached, which is sometimes captured at a standstill. This visualization with its cursory similarity—which is, in addition altered—intensifies the fallibility of a mechanics of retroaction between the source signal and its translation. The artificiality of this intelligence thus links up with the one that Huyghe sets up by way of his artefacts, which are so many pathogenic processes, or problematic centres of emergence. By re-using the scientific arrangement in his own system (and vice versa), the artist exposes us, in the end of the day, less to the possibility of the facts—which are confined to that of artificial intelligence mainly stemming nowadays from the intensive calculus of computational technologies—than to the potentiality which, in its internal contradictions, opens up the desire for absolute creative artificiality. In both instances, the artefact supporting it stems from this same matrix of a congenitally defective optimization. It is traversed by that famous principle of “order from noise” posited by Heinz von Foerster, wherein the dialectical movements of intentional anticipation and involuntary emancipation affect one another, pace one another, and work a mutual hallucination, like the sides of one and the same reality which in-occurs, and which then manifests itself like a dizziness or an ever-imminent toppling through which Roger Caillois would decelerate the force of a technique capable of “destroying for a split second the stability of perception and inflicting on the local consciousness a sort of voluptuous panic”.1 Between ecstasy and withdrawal, adhesion and separation, in what struggles to create imagery of and for our mind, there flow back the accidents of Francis Bacon’s paintings, or the awful stickiness of Ed Atkins’s videos. For there is a repetition of these same unstable and divergent games which Marielle Macé refers to with regard to Caillois’s dizziness, acknowledging that they “do not aim to do away with disorder by virtue of order, but to create a form which adjusts its struggle, and which makes it experience the eternal and living duel”.2 This proven form of perversion is also captured in the stammering uncertainty of the title, “UUmwelt”—read: UnUmwelt—or in this dissociation affecting the integrity of the “soap bubbles” which, in this concept of Umwelt, form Jakob von Uexküll’s environments. In the basically viral condition of the zones intensified by Huyghe, one pays “the price of the absence of envelope”, as Peter Sloterdijk would put it. So what is involved is assuming the positive nature of a “being-without” disavowing the value of the exhibition or of explanation, making us run the risk of the vulnerability of exposure4 of the implicit and irrational dialectic which simultaneously seals union and gives rise to disjunction. Gilles Deleuze saw in the topos of the cerebral space those relative environments complicating the mechanics of separation in the “joint presence of a within more profound than any inner environment, and a without more distant than any outer environment”.5 Nowadays, in ever more nebulous dialectical relations, art and science are redefining an ontological plasticity.6 It goes beyond the material immanence and the speculative transcendence of a reality, and lends it the uninterpretable ambiguity of the host (a key figure in Huyghe’s work), giving as much “to” as taking “from”. Biotic and abiotic, human and non-human, tangible and virtual constellations can be experienced here in a chiaroscuro embrace which makes them distinct and which also links them together as improperly real. 2 Marielle Macé, “Caillois, technique du vertige”, Littérature 2013/2, n°170, p. 8-20. 3 Jakob von Uexküll, Milieu animal et milieu humain, Paris, Bibliothèque Rivages, p.71. 4 An Anglicism that Yves Citton uses about the German philosopher’s Spherology, “Faire voir les sphères d’un imaginaire invisible”, Local.contemporain, n° 3, 2006, p. 64-68. 5 Gilles Deleuze, L‘image–temps. Cinéma 2,Paris, Les éditionsdeMinuit,coll. “Critique”, 1985, p. 275. 6 Illustrated by the approach of various philosophers re-visiting Hegelian dialectics, and in particular Catherine Malabou, whose research has also considerably helped to shed light in this condition of existence within that of cerebral plasticity. 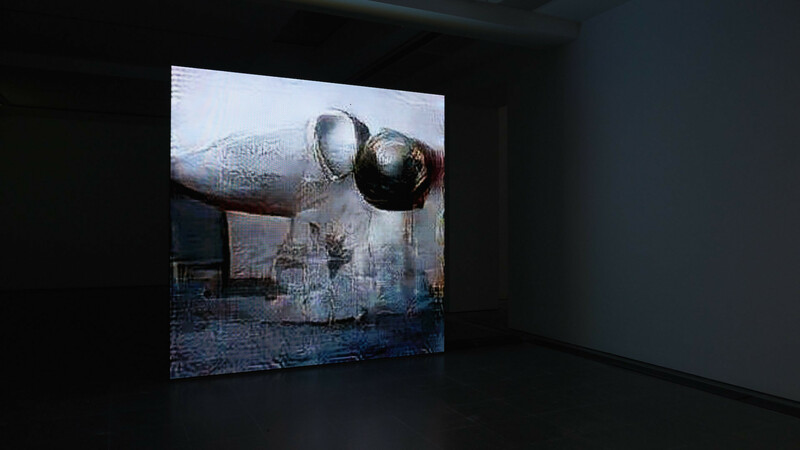 Image on top: Pierre Huyghe, « Uumwelt », installation view, Serpentine Gallery, London. Photo : Ola Rindal. Courtesy Pierre Huyghe ; Serpentine Galleries.